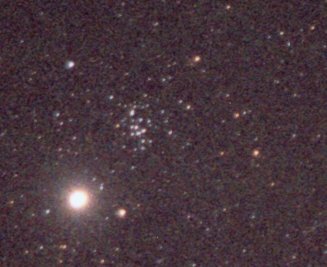 The Beehive Cluster (also called the "Praesepe"), Messier 44, lies in central Cancer. At a distance of 595 light years, four times farther than the Hyades, this 750-million year old cluster appears smaller and fainter. The very bright body is Jupiter, which just happened to be passing by when the photo was taken (a full 12-year orbit after the picture of the whole constellation was taken). The orange color of the four labelled giant stars shows nicely.